Amazon Price: $69.99 (as of October 18, 2017 8:06 am - Details). Product prices and availability are accurate as of the date/time indicated and are subject to change. Any price and availability information displayed on the Amazon site at the time of purchase will apply to the purchase of this product. 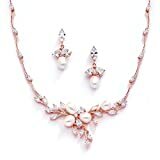 Sheer elegance describes this Genuine 14K Rose Gold plated wedding necklace and earrings set boasting a lustrous cluster of Genuine Freshwater pearls and brilliant Cubic Zirconia marquis-cut leaves. Whether walking down the aisle or gliding acrosss the dance floor, all eyes will be on you in this designer jewelry set. The necklace measures 17 1/2" long and is 1 1/4 inches h at the center. The lightweight matching pearl teardrop earrings measure 1" h and include posts and comfort disk backs. Complete your luxurious ensemble with our matching Mariell Designs bracelet style 3041B-RG, sold separately – you're worth it! We promise you'll adore the organic beauty and endless glamour of our top selling blush gold freshwater pearl and cz earrings and necklace set – or your Money-Back. Treat yourself or someone you love to some seriously gorgeous zirconium sparkle with head-turning couture style at a fraction of the price of genuine pearl and diamond rose gold jewelry! With its utterly sophisticated silhouette, you'll have your admirers guessing if you just stepped out of a 5th Avenue jeweler! Meticulously crafted with AAAAA Cubic Zirconia and Freshwater Pearls, you'll fall in love with this impossibly gorgeous Pink blush gold necklace set. Complete your jewelry ensemble with our matching bracelet style 3041B-RG. As always, enjoy Mariell's 100% Risk-Free Purchase and LIFETIME GUARANTEE.